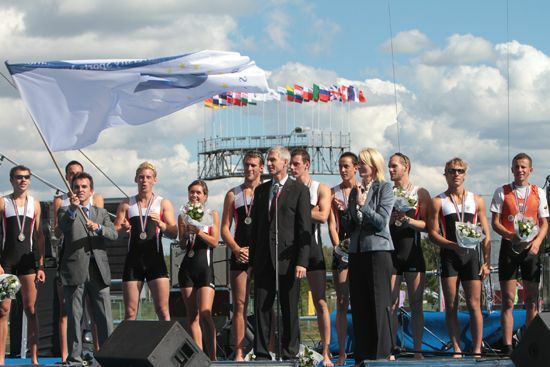 The 7th EUSA Rowing Championships concluded in Moscow, Russia, on September 2, leaving the athletes with many excellent memories & very satisfied with a fantastic event. 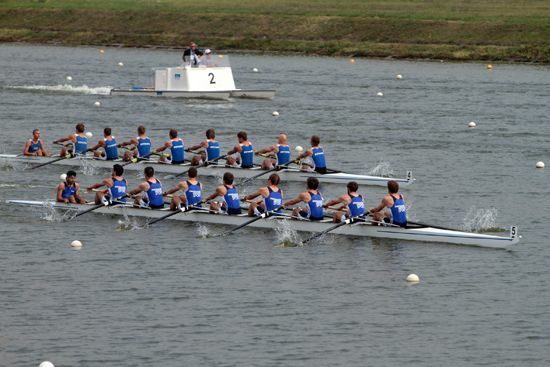 Finals Day saw very high-quality racing and some tight finishes, with two photo-finish prints required to identify the Ladies Eights medallists. Economy Bydgoszcz retained the NSRF trophy for the lead University, whilst hosts Russia captured the EUSA Salver as overall top nation. At the closing ceremony, the medals were awarded by Mr Oleg Matytsin, RSSU President, Mr Aitor Canibe Sanchez, EUSA EC member, Mr Josip Kostelic and Mr Nigel Mayglothling, EUSA technical delegates. 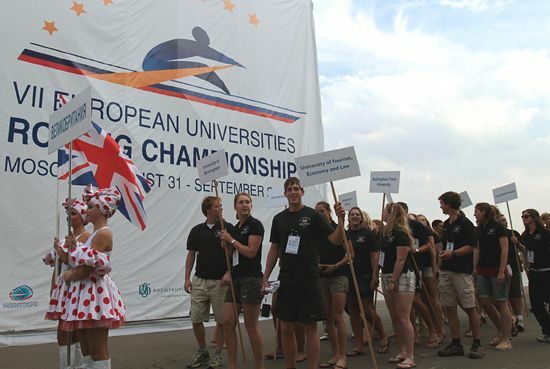 On behalf of EUSA Mr Canibe Sanchez thanked the organisers, and in the end received the flag which is to be passed on to the next organisers of the European Universities Rowing championship to take place in Poznan, Poland in 2013. 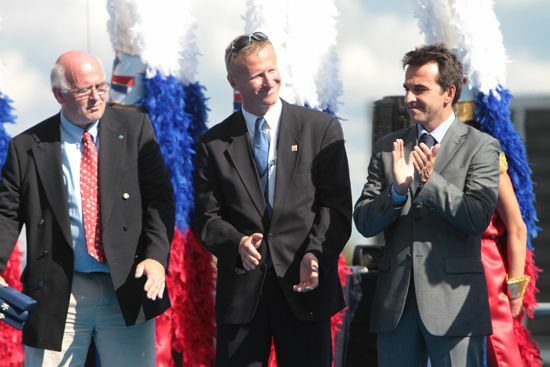 The Moscow Olympic Rowing Course provided an excellent venue with the Russian University Sports Association & Russian Amateur Rowing Association willing & supportive partners. A special word of thanks must go to co-ordinator Alisa Vashenkova who worked tirelessly to deliver the event and to the boat-trailer drivers, unseen heroes who overcame numerous problems in driving many thousands of kilometres to ensure boats were delivered to Moscow. 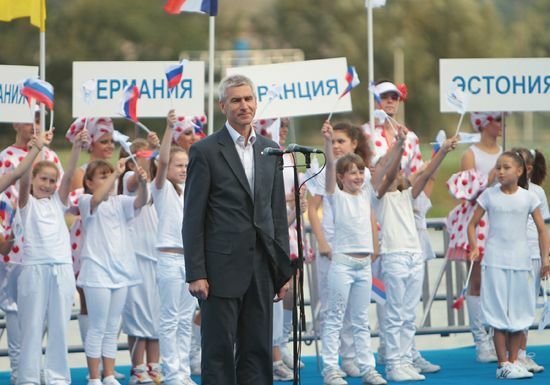 The Opening Ceremony of the championship otherwise took place on the evening of August 31th, 2011, in Moscow at the Olympic Rowing Centre. 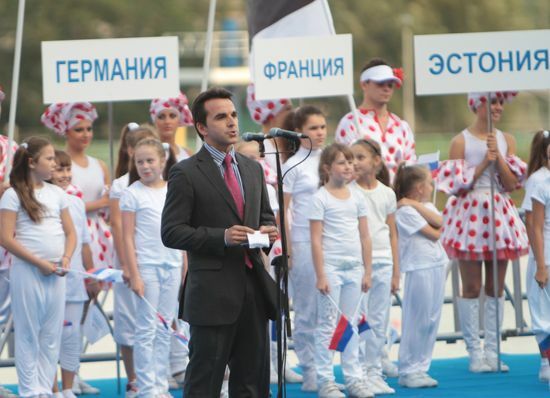 The Ceremony was attended by Mr. Oleg V. Matytsin, President of the Russian Students Sport Union who welcomed participants on behalf of the Organizing Committee. EUSA EC Delegate Mr. Aitor Canibe Sánchez, also welcomed all participants and wished all the teams and participants who came to test their skills and abilities great competitions and all the best. He also thanked the Organizing Committee for all their contributions. The competition was organized by the Russian Students Sport Union with contribution of the Department of Physical, Culture and Sport, Moscow Government and took place from August 31st to September 2nd in Moscow. EUSA was represented by Mr. Aitor Canibe Sánchez and the Technical Delegatess Mr. Josip Kostelic and Mr. Nigel Mayglothling. They made sure that the event went on smoothly and without problems. 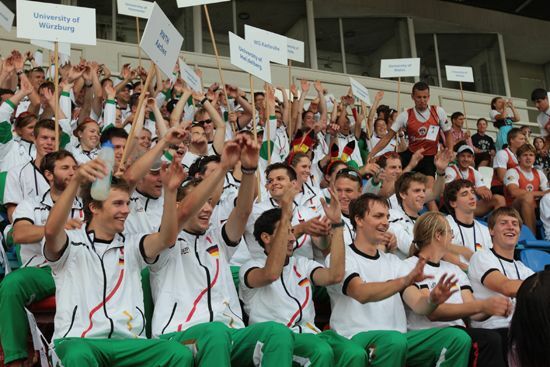 The Competition hosted 160 male and 152 female competitors from as many as 54 Universities from 15 countries. Below you will find the medallists per category; please visit www.rowing2011.eusa.eu for detailed information and more pictures.